As you can probably guess, first up is Origins Moisturiser £36 here. I cannot rave about Origins enough. I have only been using Origins since the beginning of the month but seriously. Words can’t describe. This one product has literally transformed my skin from rags to riches- skincare style. More ravings coming later on Blushous Beauty Originswise’ if you’re interested! I'l be sure to keep you updated. Chanel Allure Lipstick in number #112 'Fantasque' £25. (I think- it's sold out online at the moment!) My current makeup routine has heavily featured this beauty of a product. A really light natural pearly pink. A ‘my lips but better’ kinda colour, with a satin-ish finish. First off, the packaging is heavenly, you can’t ever fault Chanel on their packaging, and secondly it is really moisturising too! That’s love right there. MAC Blush in Style- £18, here. For that perfect pinch of colour on your cheeks that can be built up and never look to over the top, you need to get all over this beautiful peachy blush. May I just point out that it is my all time favourite blusher- that really is a bold statement. I have been wearing my Maybelline Waterproof Colossal Mascara £7.19 here. It’s one of those mascaras that is really wet at first and you have to pump some air into it to get that nice mascara texture you usually get after about 10-15 applications, (know what I’m talking about?) but when it reaches its peak. Wow. My eyelashes go from short and stumpy and barely worth calling eyelashes to BAM! ‘Girl you got some eyelashes on you!’ –emphasize the you for maximum impact. Being waterproof there is no danger of any smudging- perfect, and it dissolves easily when removing unlike most pesky waterproof mascaras. Tip: For added impact, I curl my wand just by bending it on the top of the mascara bottle/packaging you know what I mean. Not too much though, only for a natural replica of the shape of your eyes. More of the post after the photos! Ok moving onto YouTube. I have come across some new YouTubers this month who I have been LUV-ING. First up- Sona Gasparian. (Find her channel here) This girl is absolutely drop dead gorgeous. Not only is she a renowned makeup artist, she posts the most helpful, interesting and beautiful makeup tutorials on her channel! I just can’t take my eyes off her. Go and check out her instagram too, here. She posts the coolist pictures and I find myself stalking her instagram most days. Which brings me onto Teni. (Find her channel here) I actually found Teni whilst stalking Amelia Liana, and I am so glad I did! Because she then helped me find Sona when I watched them collaborate on a ‘get ready with me’ video- this one here to be precise. Like Sona, she is absolutely beautiful. I like the fact that she uses a lot of products that I am not familiar with, because it gives me more makeup to add to my wish list! I think they are more popular in the US. I definitely need to start writing a ‘What to buy when I next hit the US’ list because my mental checklist is overflowing! Again, check out her Instagram hereto drool over her outfit posts, hair posts, and cute pup posts. Third up- Suzie from Hello October. She is just such a sweety! She posts, in my opinion, a lot of ‘girl next door’ beauty and fashion videos which is great. Really natural makeup looks that can be achieved by even the most inexperienced makeup application-er. The fact that she is Lily Collins mystery identical twin, and has such a mouthwatering taste in fashion is enough to add her to your favourites. She definitely has me online shopping night after night, creating endless window-shopping baskets! Tanya Burr. Although not a new favourite of mine, Tanya Burr definitely repeatedly stays top of my favourites list. This month I have been going Tanya Burr crazy keeping up to date with her product launch of #TanyaBurrsLips&Nails. Yes I just used the hashtag for the second time in this post. So what? I’m cool I can get away with it. I’m looking forward to getting my hands on some of her lippies for sure! Find her website here, and browse her new lip gloss and nails collection exclusive to eye CANDY here. I am so in love with all photos being broadcast my way from the new YSL spring collection and the Chanel spring collection. They look so perfect from the packaging to the colours to the everything. Let me know if you’re planning on getting your mits on either of these new collections! My January girl crush(s) - Yep I have two this month! Mollie King and Sona Gasparian. 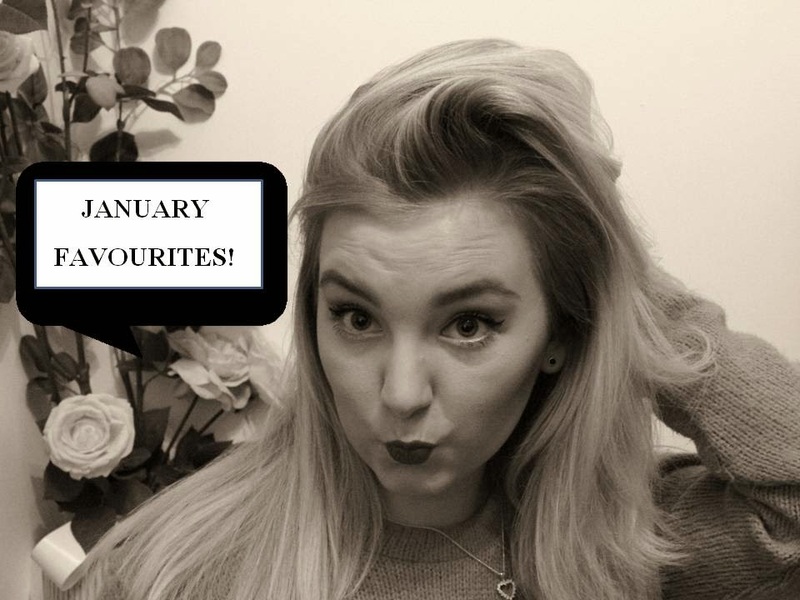 So that is it for my January Favourites, maybe there are some products, YouTubers and Instagrammers I have given to you to add to your stalk list/wish-list! P.S throughout February, I am taking part in #FashionFebruary with some fellow bloggers, so keep your eyes peeled for a month of fashion related posts also! Catch up with me on Twitter, Facebook, Instagram and Bloglovin' I love a chitchat so don't hesitate to pop me a question or conversation whenever you want!